We’ve loved Joy for years. We read her blog, attempt her DIY projects (attempt being the key word), and buy every piece of Target merchandise she has designed. 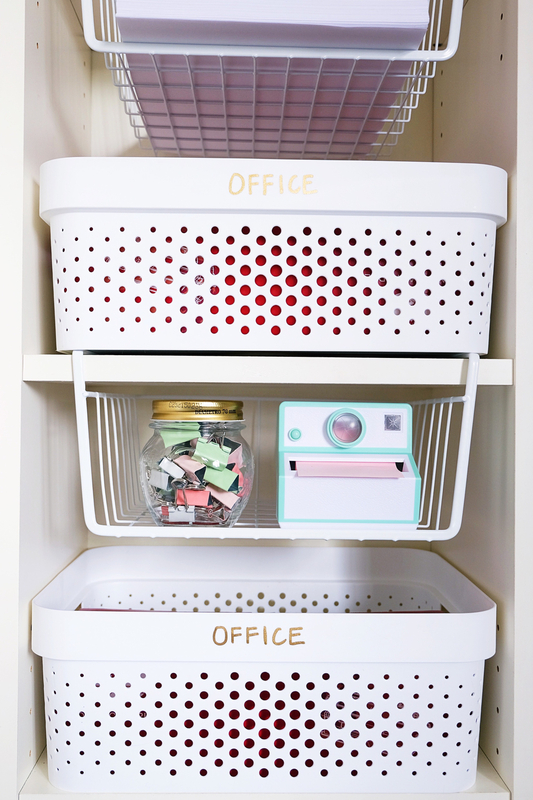 So when we had the opportunity to organize her home office, we knew we had to come up with something original, functional, and in keeping with her style. When we arrived at her house and surveyed the space, we realized this was as much a project for her husband as it was for her. It’s where he kept office supplies, computer cables, and even his tool sets. 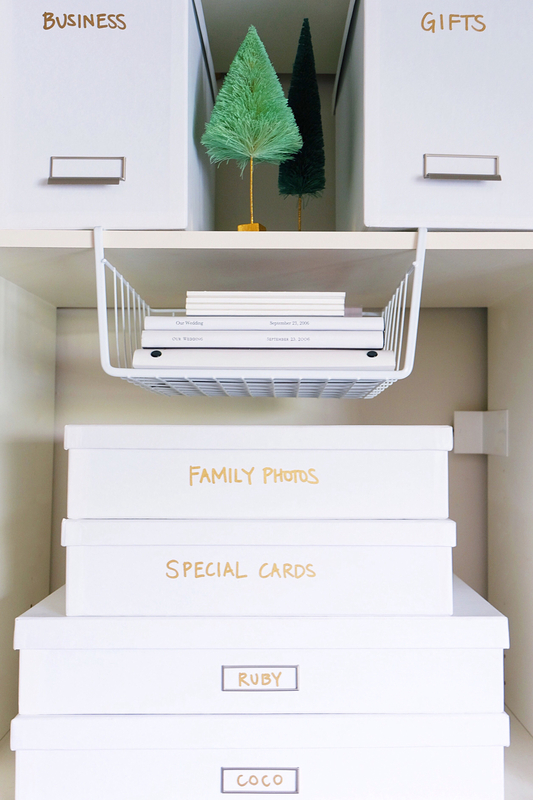 It was also a multi-purpose space storing holiday decorations, family stationery, gifts, and photos. Once we established all the categories, we piled everything into large groupings so we could clearly see the entire inventory. We had selected a wide variety of product that would help maximize the space and hold the large amount of categories. The only roadblock was fitting everything on the narrow shelving. Some of the shelves were bigger, but the majority didn’t accommodate the bins we had purchased. So when in doubt…..turn the bin to the side. 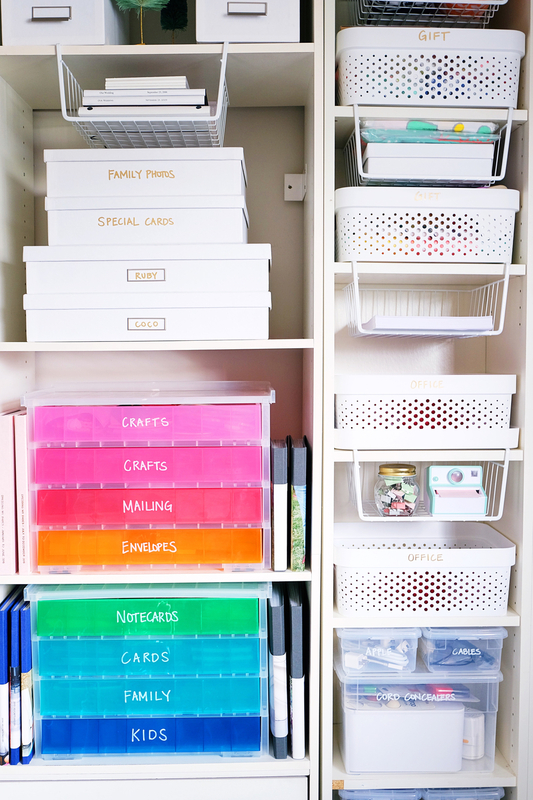 We used these great white bins from Target, and paired them with an undermount wire shelf that would take advantage of the height. 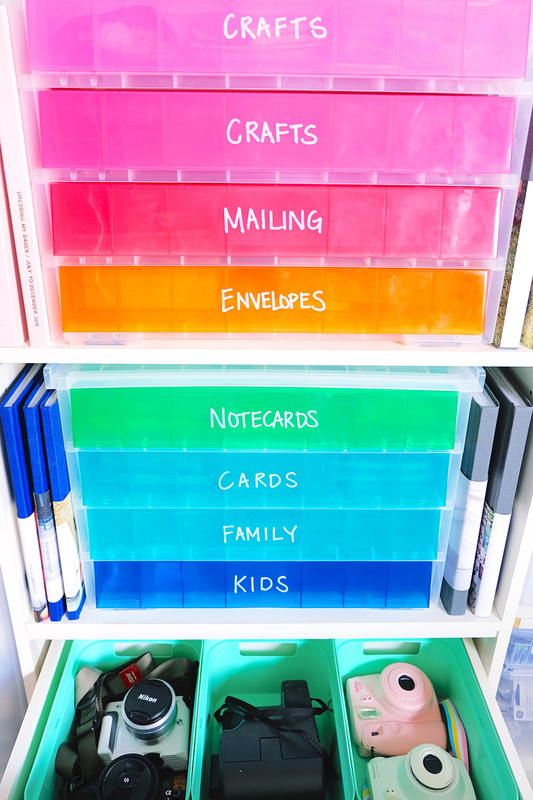 The larger shelves were able to fit these great rainbow stacking drawers that held all the stationery, cards, and crafts perfectly. For all the photos and sentimental items, we used white archival boxes that we labeled in gold ink. One of the most important items in the office is the set of cameras that both Joy, and her husband use. But one of our favorite camera sets actually belong to her little girls Ruby and Coco. 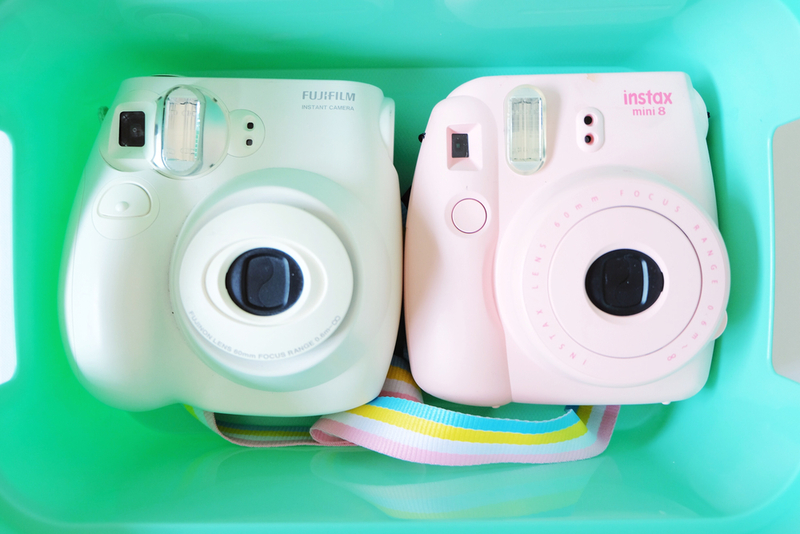 They are the most perfect pink and white Polaroids that look good enough to eat. We found small mint containers that fit the drawers perfectly and kept all the cameras and parts contained. it was so much fun setting up Joy’s office and spending time with her family. Ruby got her own jar of paper clips, Bob got a box for his vintage 3D camera, and Coco had to be locked out at all times so she didn’t scale the shelves. Can’t wait to see these guys again! If you have any questions about the space, leave a comment or send us an email! Thanks so much! That’s so kind! Found you guys via Emily Ley’s IG, <3 it all! Excited to see more posts! Thank you! Excited to have you following along! What type of markers did you use to write on the bins?? We use Sharpie paint pens for all of our projects! What shelves did you use? They were already built into the space! But we added the colorful drawer unit for additional storage options. Love this! It says exact rainbow drawers aren’t available online but did you buy in store? 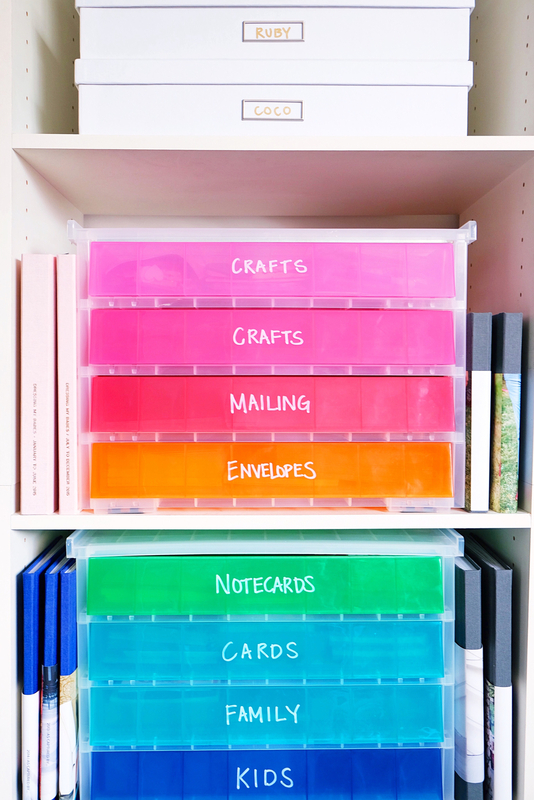 Container store?